"Progress is definitely happening in the Stone House, as we have now shifted our focus to remodeling the inside of the building. 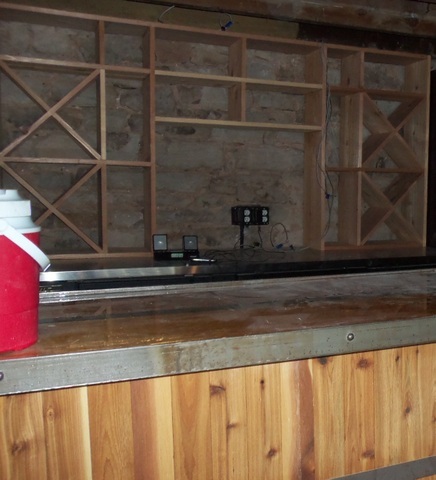 For the first floor, our crew took a unique approach and built the bar to resemble a wine barrel. On the opposite end, our crew built bench seating with cubbies underneath for customers personal storage of their belongings. A special message to the ladies: You now have an area to store their purses when you sit down to enjoy a glass of wine! In between the bench seating we have installed a wood burning fireplace for customers' pleasure, as well. Our crew is finishing up the restrooms on the first floor and built an additional closet for extra storage space. "Currently, we are working on the second floor, setting up drywall and getting all the lighting into place. Our crew set up the lighting on the outside patio late last week. The lighting of the building is beautiful at nightfall, and we hope that the community will enjoy the view as they walk or drive by the Stone House. "We want customers to not only remember the historic ambiance that that building carries, but also the unique innovations that we have put into this project! We are very excited to be nearing completion and cannot wait to open our doors very soon! We are extremely grateful for the ongoing support and excitement from the community!"